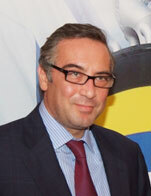 Mr. Tsakos is the founder, Chief Executive Officer and a director of the Tsakos Energy Navigation since inception. He has been involved in ship management since 1981 and has 36 months of seafaring experience. Mr. Tsakos served as an officer in the Hellenic Navy in 1988. He is the former President of the Hellenic Marine Environment Protection Agency (HELMEPA). Mr. Tsakos is a member of the council of the Independent Tanker Owners Association (INTERTANKO), a board member of the UK P&I Club, a board member of the Union of Greek Shipowners (UGS), a council member of the board of the Greek Shipping Co-operation Committee (GSCC) and a council member of the American Bureau of Shipping (ABS), Bureau Veritas (BV) and of the Greek Committee of Det Norske Veritas (DNV) and a board member of Bank of Cyprus. He graduated from Columbia University in New York in 1985 with a degree in Economics and Political Science and obtained a Masters Degree in Shipping, Trade and Finance from City University Business School, London in 1987. In 2011, Mr. Tsakos was awarded an honorary doctorate from the City of London University Business School, for his pioneering work in the equity financial markets relating to shipping companies.